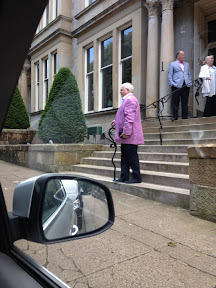 CHRISTOPHER Biggins fled the heat of London and the aftermath of Celebrity Big Brother by escaping to Scotland on a secret short break with his friends. The larger than life TV personality apologised publicly after being at the centre of a racism and biphobia row following his time in the Big Brother house. And straight after exiting the house he packed his case to take a holiday in Glasgow and get away from it all. Biggins, who was removed from the house last week, was keen to get back to normality as he checked into the plush Hotel Du Vin in the stylish West end on Tuesday. The hotel has been frequented by everyone from Britney Spears and Justin Timberlake to George Clooney and Simon Cowell. He visited the neighbouring Hyndland restaurant Epicures for some late lunch before popping into a newsagent across the road to buy some comfort snacks. Looking bright and breezy in his pink hued jacket he went out drinking for five hours with his his friends. Returning from his evening out shortly before ten pm he was in a jovial mood as he emerged from the taxi. His friends laughed: "It's Santa Claus without the beard." Asked how he felt after exiting the Big Brother house he added: "I've been made a scapegoat. I've been stitched up like a kipper." Questioned if he was getting abuse on the street he added: "People on the whole have been nice to me thankfully and I love Scotland. I'm very much having a lovely time here with my friends." 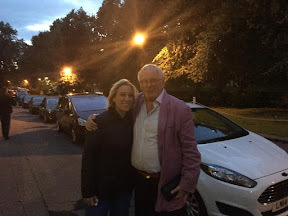 It's thought that Biggins then visited Edinburgh to catch up with Lady Colin Campbell who had jumped to is defende following the CBB controversy. 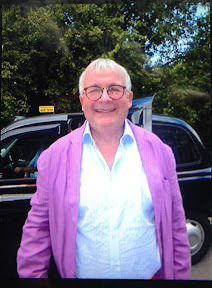 One Fringe enthusiast tweeted: "Super to see lovely @onebiggins, who kindly let me Q-jump at airport yesterday, on way back to @Gildedballoon to @LadyColinCampb show".